Mangroves provide vital habitat to many creatures and important ecosystem services to human communities, but are being whittled away as rising seas drown them and people clear them. A new study finds that Southeast Asia lost 2 percent of its mangroves from 2000 to 2012. The main drivers of this loss were clearing for aquaculture, rice production, and oil palm plantations. The authors caution more mangroves will be deforested unless policies change. Mangrove forests ring the coasts of many tropical and subtropical areas around the word. They act as the interface between land and sea, providing vital habitat to many creatures and important ecosystem services to human communities. They are also sequester some of the highest densities of carbon in the world. 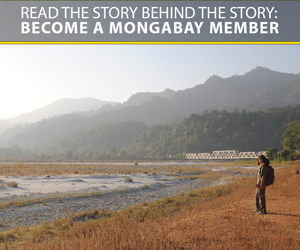 However, mangroves are under threat from both sides as sea levels rise and people move in. A new study published today in the Proceedings of the National Academy of Sciences (PNAS) looked into the impacts of land use changes on Southeast Asian mangroves. It finds that 2 percent of the region’s mangroves were lost during the past decade, owing primarily to aquaculture, rice, and palm oil. Mangroves are important for a plethora of reasons. They act as fish nurseries, providing for marine food chains that in turn supply income and sustenance for human communities. Mangroves stabilize coasts, reducing erosion and the damaging effects of hurricanes and tsunamis. And research indicates they store four times as much carbon as other tropical forests. In total, scientists peg the monetary worth of the world’s mangroves at $194,000 per hectare every year. A mangrove forest in Queensland, Australia. Photo by Rhett A. Butler. But many mangroves have already been destroyed, and others are at risk. Historical deforestation estimates indicate more than one-third of the world’s mangroves may have been lost in the 1980s and 1990s; 16 percent of the plant species that make up those that remain are threatened with extinction. To better understand how quickly Southeast Asia’s mangroves are disappearing and what is driving it, researchers at universities in Singapore and the UK analyzed satellite-gathered data and identified land use changes in the region. They found that more than 100,000 hectares of mangrove forest were lost between 2000 and 2012, amounting 2 percent of Southeast Asia’s mangrove cover. Spread out over the study period, this equates to a loss of around 0.18 percent per year, which is less than previous estimates. The authors say this is due largely to today’s higher-resolution satellite imagery. The biggest mangrove deforestation “hotspots” were in Myanmar, Sumatra, Indonesian Borneo, and Malaysia. Thailand, Vietnam, and the Philippines showed comparatively lower rates of loss. The biggest drivers of mangrove deforestation turned out to be aquaculture, rice, and palm oil production. Of these, aquaculture – the farming of fish and other aquatic commodities – won out, amounting to 30 percent of the region’s mangrove displacement. In Indonesia, nearly 50 percent of mangrove clearing was driven by aquaculture. The authors also highlight high levels of rice production in Myanmar, which drove around 88 percent of the country’s mangrove deforestation. The authors write that the expansions in rice in Myanmar and aquaculture in Indonesia are both due to government initiatives as Indonesia vies to become the world’s biggest aquaculture producer and Myanmar tries to improve food security. 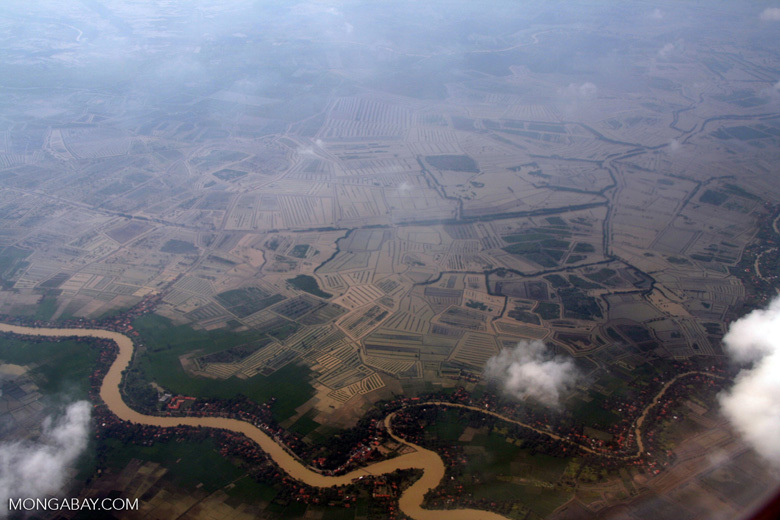 Aerial view of rice paddies where mangrove forests once grew in Java, Indonesia. Photo by Rhett A. Butler. 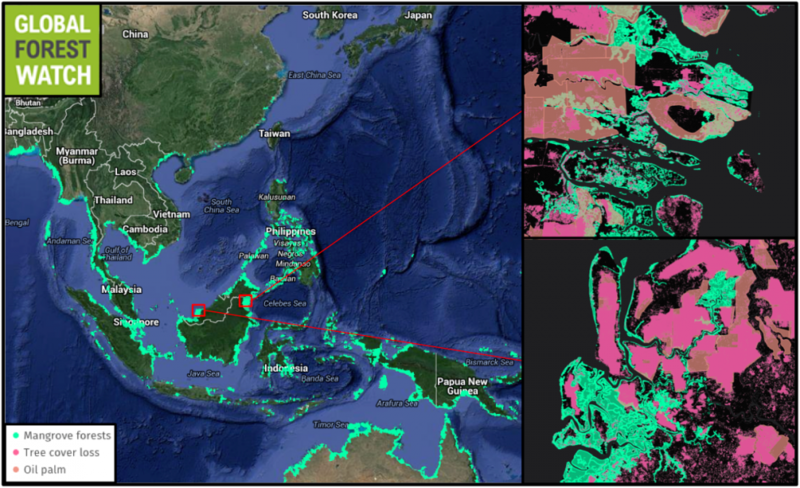 Global Forest Watch shows palm oil plantations occupying mangrove areas in Indonesian (top) and Malaysian (bottom) Borneo. The study also highlights palm oil as a rising force in mangrove destruction. Malaysia and Sumatra (Indonesia) showed particularly high levels of palm oil-driven clearing. 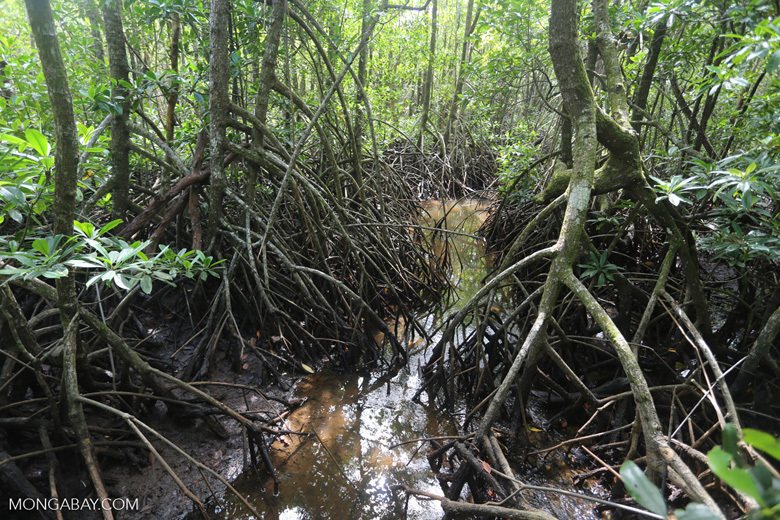 The authors warn that because mangroves exist both on land and in the water, they can fall between the cracks when it comes to monitoring and management. This means that mangroves may be less protected from industry encroachment. Papua’s relatively pristine mangroves, the authors say, may be particularly at risk of displacement by oil palm plantations. The researchers write that policy interventions are needed to stem the deforestation of Southeast Asia’s mangroves. They suggest this study could be used to help governments understand the state of their mangroves and what actions could best help keep these forests – along with their many benefits – rooted firmly in the ground.